Would you be surprised to learn that historic 1800's IPAs were generally single hop beers? Obviously, IPA brewing has changed a lot since then, but even as we're relearning how super-hopped and overcharged those original beers were, it's worth remembering that those IPAs were also usually SMaSH (Single Malt and Single Hop) beers, with East Kent Goldings defining the style for many decades. Was that because EKG was perceived as so clearly superior to the other varieties available at the time, or because they didn't have all the hundreds of exciting hop varieties we have today? Today, IPA recipe formulation is a very different story, with so many options and combinations of flavor-groups. People are brewing great IPAs with every strategy imaginable, to be sure, but with certain varieties so prized and expensive, you want to know you're using them to the best of their abilities. You want your IPA to stand out from the rest, without growing overcomplicated and muddled. It didn't take me long to start forming my own opinions about how many different hops to use, and in what kinds of recipes. But I wanted to see what others are doing — how the highest rated IPAs tend to fit together. And how do imperial IPAs differ in their formulation? After many hours of research, I present to you a short statistical analysis of the number of different hop varieties in the world's highest rated IPAs. To avoid bias, I simply used the top 20 IPAs and Imperial IPAs on both Beer Advocate and Rate Beer (minus duplicates). While rating sites are imperfect, this at least gives a healthy cross-section of notable IPAs that you'll have a good chance of being familiar with. So, let's dive in. - According to Jeff Erway of La Cumbre, the exact hop bill for Elevated IPA may change due to hop availability. Jeff was kind enough to share the exact hop bill with me, which currently includes seven varieties: Columbus, hop extract for bittering, Zythos, Chinook, Simcoe, Nelson Sauvin, and Southern Passion. - Stone's blog lists 11 hop varieties for Enjoy By. However, due to the nature of the beer (it's brewed on a rotating "batch specific" basis) it's not clear if these are all the hop varieties that have been used in the beer, or if all 11 are used every time. Based on comments in Mitch Steele's NHC presentation, it sounds like Enjoy By typically uses 7 varieties. While none of this information will blow the lid off the secret to crafting a perfect IPA, I think a few interesting trends can be noted. Many of the older trend-setting IPAs are those with higher numbers of different varieties — these recipes were born largely before particular hop varieties had their own following in the craft community. Sure, people knew what Cascade was, or that Centennial was real nice, but they were simply steps taken toward a great beer. Over time, as particular varieties became exceptionally scarce and sought-out by brewers, these varieties would start to become the actual selling point, rather than a key ingredient. In the last couple years, many people have sought out IPAs specifically because they used Citra, and you'll notice that many of the "low number" beers in the list feature Citra hops, or something similar and equally popular, like Galaxy or Nelson Sauvin. One surprise in the results is how many imperial IPAs feature only one hop variety, as compared to regular IPAs. I suppose this may be that the extreme hopping expected of imperials allows that one variety to be really, really showcased. From there, the results decrease linearly until we reach 6 varieties, which is a curiously popular number of hops to use in both IPAs and imperials. Why 6 and not 5, or 7, I'm not sure, but this spike represents the other school of IPA brewing, and the more traditional method. Here, rather than focus on a specific hop flavor, brewers are focusing on a general hop characters achieved through blending — say, dank + earthy, or piney + floral, or super citrus, etc. Many of the most popular IPAs of the last ten years have followed this "range of hop character" approach, and there are definite advantages to it. For one, it seems it would be easier to hit your target with a larger arsenal at your disposal. Say you want an imperial IPA heavy on pine and dank resin; the "classic" American IPA character. Certain hop varieties are scarce and you can't rely on them, but a blend of other varieties will get you there too. Of course, a beer focused on a single, popular hop is easier for a small 20 bbl brewery to brew, versus a brewery that must obtain enough of that hop to produce 100 bbl at a time. Or, similarly: a beer that is brewed as a one-off batch, versus an IPA that is a year-round staple. More established brewers can use their size and leverage to obtain solid contracts, but there may simply not be enough of some varieties to lean too heavily on them, and thus blending zeitgeist hops becomes a necessity. Pay attention to which breweries are brewing which sort of IPAs, and I think you'll see this played out in the results. Tony Lawrence of Boneyard Beer in Oregon was kind enough to talk to me over the phone during what sounded like a very busy day, and indicated that he feels his recipes are focused more on quantity and timing than on particular varieties. "It's how much — how and when you use them — not so much which hops you use," he told me. Tony will take new hop varieties coming down the pipeline and work them into his recipes. However, the maths are pretty clear when it comes to brewing a regular IPA — three seems to be the way to go, with 45% of all IPAs surveyed utilizing three varieties. This makes sense, too — imperial IPAs tend to go big and bitter and heavy on the resin, and a blend of hops will achieve that handily. But a smaller beer allows a tighter focus, and one or two hops can carry the show. Base a beer around a really characterful hop like Nelson or Simcoe, and you'll risk smudging some of its finer touches if you pair it with too much competition. Too many hops in a smaller IPA can get muddled. When cooking, you don't want to overdo the spices — use everything in the cabinet and they'll start averaging each other out, rather than adding to the flavor. I hope this information was useful despite the small data set. Gathering all the info was a surprisingly time-consuming process, and I wish I could have tracked down complete info for every single beer. It would be interesting to extend the list to the Top 50 or even Top 100 beers, but that is an overly ambitious project for this particular blogger at the moment. Got info on any of the beers I'm missing? Got a favorite IPA with a hop bill that you'd like to mention? Please do share! I believe in Mitch Steele's NHC presentation this year he said the Enjoy By release prior to the presentation had seven varieties in it. He said the whole "Enjoy By" line was designed to use many hop varieties to avoid market pressure when some hop varieties cannot be bought. I'm not entirely sure I buy that premise because each hop they picked is a tough one to find in the spot market. Even cascade can be hard to find on the spot market. Okay, that makes sense. I figured it probably changes from iteration to iteration just based on taste (and practical concerns of using that many hops). Thanks for the info! You list Falconer's Flight as a 1 hop beer but this a blend of several hop varieties. True, good point. I guess it should technically count as more than one hop. Re: Alpine Beers, Keene Idea is Nelson Sauvin and Motueka, Nelson is Nelson Sauvin and Southern Cross. Both incredible and considering how limited in production they are, amazing that they made the list. Well deserved. Good thing I'm just up the road from them. Might head over there tomorrow for a growler fill. Thanks for the tip, much appreciated. Lucky you, living right close to Alpine! Did you get this information from conversations with the brewers? I think it'd be interesting to run the same analysis on IPAs that are not necessarily the top rated, but most readily available on the market. Yeah, I guess that would make for an interesting comparison. Might be a harder set to establish. I guess you could just look at the IPAs with the most reviews? Or try to find distribution info. It would be interesting to see if that set meshes with my theory that mass-production IPAs are more likely to rely on large blends of hops. What Cathcart said. For all you know, the worst IPAs in the world could have an average of three hop varieties too. Yeah, of course. I'm not sure what you'd learn from that, though. Again, I don't think this is the secret to brewing a perfect IPA or anything, just a look at some trends and strategies. 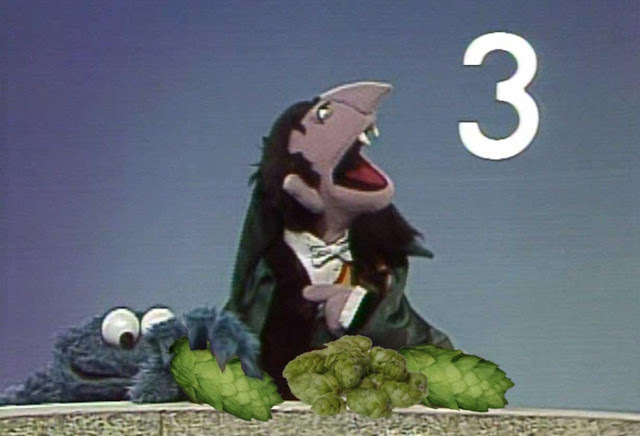 but in that hypothetical case, suppose the top 3 hops of the "control" IPAs are different than those for the best IPAs. Once again, excellent beer writing and research, Derek! Quality > quantity any day. Great analysis! What was the source of the Treehouse Brewing interview? Thanks! It was an issue of Beer Advocate from last year. I'll have to go digging through my stack of magazines to figure out which issue exactly, since they don't put the stories online... I'll let you know if I can dig up the exact one!